The typical British adult can stand queuing for 10 minutes and 42 seconds before their patience starts to fray, according to research published by the Payments Council. 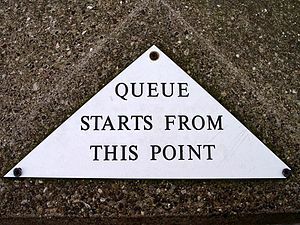 Indeed, the stereotype of patiently queuing Brits is becoming a thing of the past, with eight in ten UK adults (83%) turning to virtual alternatives, from shopping online to direct debit bill payments, to avoid the need to stand in line. The nation’s favourite ways to avoid queuing are to bank and pay bills online (58% and 54%), buy travel or event tickets remotely (45% and 39%), and to purchase goods such as books and electronics online or over the phone (35%). However, the survey also reveals some of the more drastic measures people are adopting to preserve their precious time, especially among younger people. One in five people (21%) have done their shopping at night to avoid queuing, while 18% have changed what they buy or where they shop. More extreme still, one in 12 (8%) young people (18-34) have taken time off work to avoid peak time queues, and one in eight (12%) admit to sending someone else to queue for them (compared to 5% and 8% of the overall population respectively). Asked about their biggest annoyances when waiting in line, two thirds (66%) said they can’t stand other people “faffing” around in front of them, with other top peeves being children getting bored and frustrated, and other people in the queue causing irritation. Despite these aggravations, only four in ten (40%) make sure they have everything to hand by the time they get to the front, and only 14% try to pick the fastest way to pay. And whilst older respondents (over-55) admit to becoming restless nearly three minutes before younger people – with breaking points of 9 minutes 30 seconds, and 12 minutes 18 seconds respectively – younger queuers are twice as likely to take it out on those around them. Furthermore, one in six younger adults (17%) resort to phoning friends or family to vent their frustration, compared to just 3% of over-55s. Challenging their image as impatient, Londoners were overall prepared to wait longer than anyone else, at an average of 12 minutes and 12 seconds before getting restless, 31% longer than the least patient region, Yorkshire and Humberside. 68% of the over-55s said there’s nothing good about queuing compared to 55% of the 18-34s, a quarter of whom say they like the opportunity to daydream, and a further 7% take the chance to sort out other things by phone or online whilst waiting. Overall, 12% of people said they like the opportunity to socialise with people, showing that perhaps queuing isn’t all bad. But despite our wealth of queuing experience, it seems Brits often underestimate the time it can take to queue, with 12% saying they have missed a train or plane due to waiting in a queue, rising to 20% of those aged 18-34. Other ill effects include getting in trouble at work (9%), missing a date (4%), and getting a parking ticket (11%). Supermarkets topped the list of the nation’s least favourite places to queue, followed by the Post Office and airport check-in and security.